So! You've spent up all your NC, you are too embarrassed to purchase the card at your local CVS or just don't have any NC but you want cool customization...what's a user to do! Lucky for you! I've made it my MISSION to find cool NP items that can replace NC ones for similar looks. Please feel free to neomail me all requests, questions, comments, concerns and feedback. I would like to take a moment to thank the following people for suggesting ideas and items for my page; Jennifer and Lindsey! Thanks so much! To request an item or look, please neomail me the following information! I don't require a link back by ANY means but I'd love to spread the word about my page. Click buttons to see designers. I'm useless at button making so I had them made for me. Buttons by Pretentious and Writhe. neomail me to affiliate or list me. 1. Your complete customizations aren't very complete. Why not add trickets and such? Good question! I left them sort of bare on purpose so user can add their own personality and flare. They are really more like templates than anything else. If you need suggestions for trickets or other such items, I'd be more than willing to help. 2. I used one of your designs. Do I need to link back? It would be nice but I don't require it. 3. Why do you use so many species specific designs? I hate this question. 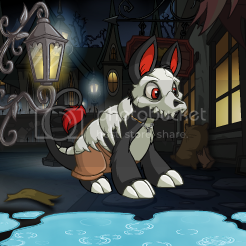 I wish I could make it so that all my designs are able to be used on every pet but I am really limited by the NP wearables that are available and if you've ever had a really good look at them, most of are really around are species specific. I do try to use general items for every pet as much as I can but it's a really hard thing to get around. If you see a species design you like and it's not for that species, feel free to contact me and I'll see if I can find other pieces for you. No promises though. Sorry. 4. Can I made more than one request? By all means! If I am very busy when you submit them, I will let you know an approximate time frame but it's rare designs take more than a day, or really, once I've started more than half an hour. 5. Is it okay to mix and match your ideas and creations? Of course! Just because I put something together a certain way doesn't mean you have to. Plus, where is all the fun if I'm doing all the work? Please do incorporate your own style, items and other items you see on my page. 6. How do you pick which species and color wear your examples? Unless someone requested their pet, it's normally random. I try to use as many different colors and pets as I can so everything you see isn't an a Halloween Kougra or whatever. 7. I have an idea that would fit on your page. Do you take collaborations? Go ahead and show me. If I use it on my page, you will, of course, be credited. 8. I noticed a broken link, image, typo or other mistake on your page. Do you want me to tell you? Of course! I'm only human and I am actually really prone to silly mistakes like that (I think WAY faster than I type). If you notice anything off, please let me know! 9. I asked for an item or look and you couldn't do it...isn't that the whole point? 10. I have a question and it's not here. Is it okay to neomail you? Request your own outfit today!